How to Evaluate Titanium Welding Visually? Generally, titanium shall be TIG welded, which means the welding shall be conducted under inert gas shielding. Both the welding area and heat affected zone(HAZ) shall be protected(shielded) by pure argon gas during the welding process until it cools down to 800°F (427°C) or below. Due to its interstitial absorption of nitrogen, oxygen, hydrogen at elevated temperatures, titanium welding shall be thoroughly shielded by inert gas. Moreover, because of the strong affinity for oxygen, titanium can readily react with oxygen to form titanium oxide. If appreciable amount of residual oxygen exists in welding area, various titanium oxides may present differentiated colors. 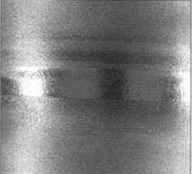 The titanium welding quality and acceptance criteria can be evaluated by observing the discoloration of welding areas. 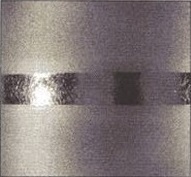 Bright silver color of titanium welding surface (Acceptable). 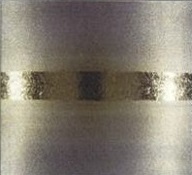 This is the ideal welding surface color which exhibits shinny silver titanium luster. The bright silver luster indicates that there is no or rare oxidation. Titanium was perfectly protected during the welding process. 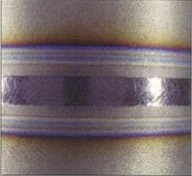 Light straw color of titanium welding area (Acceptable). Dark straw color of titanium welding surface (Acceptable). Both light straw and dark straw colors indicate that there is slight contamination during welding, but they are still acceptable. Although there is some controversy(obvious blue/ violet bands at the edge of HAZ), the dark straw color presented shall also be accepted. 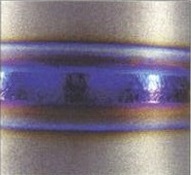 Blue color of titanium welding surface (Rejectable). 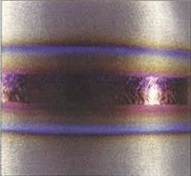 Purple color of titanium welding surface (Rejectable). 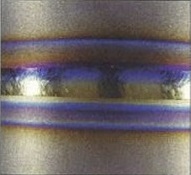 Blue & yellow color combined surface after titanium welding (Rejectable). 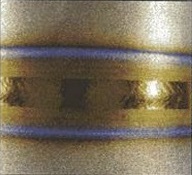 The dark blue, purple, or blue + yellow color indicates that heavier contamination may occur during welding. Generally, if the welding area exhibits one of these colors, the material shall be rejected. However, it may be acceptable depending on specific service. Grey blue color of titanium welding surface (Unacceptable). Brushed welding surface of titanium (Pending/ Unacceptable). 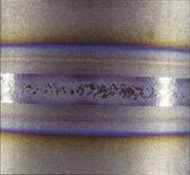 White (α case) color of titanium welding surface (Unacceptable). The grey blue, grey, and white colors indicate very heavy contamination during welding hence are totally unacceptable. The welding shall be removed by grinding. Repair and re-welding job shall be done subsequently. Especially, the white welding surface have powdery and porous titanium-oxide loose deposit. This is known as alpha case, which indicates that inert gas doesn’t work at all during titanium welding. It is the worst case of all. The original surface after titanium welding shall not be machined or ground. Otherwise, the brushed color may confuse people and affect the visual examination result. No. 176, Zhonghua South Street, Shijiazhuang, China. Copy©2016 | HeBei Metals Industrial Limited.